Maxwell X Lab, part of the Center for Policy Research at the Maxwell School, recently completed a series of projects designed to reduce overdue property tax bills in the City of Syracuse. Delinquent tax bills can lead to costly late fees, interest, liens and—ultimately—foreclosure, creating instability for home-owning families, neighborhoods and city services. So far, the initiative has helped the city to recoup more than $1.4 million in overdue property taxes, and hundreds of additional properties were prompted to get current on their bills—preventing more costly and troublesome outcomes for both the owner and the city alike. Furthermore, the project has established a costless change to city tax collection processes that has the potential to produce benefits for years to come. 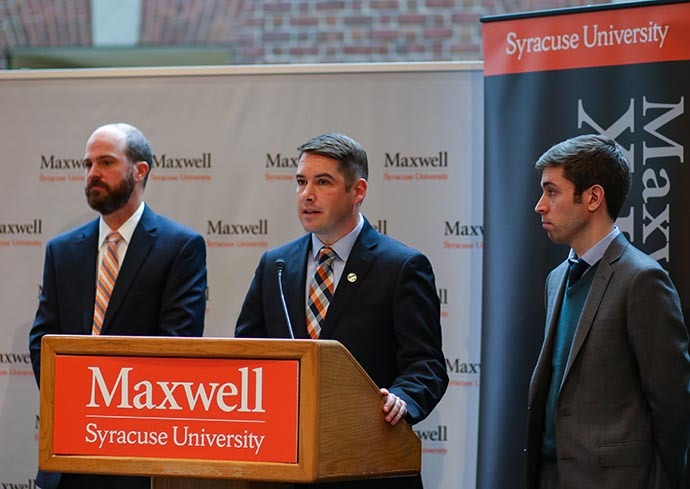 At a Nov. 13 news conference at the Maxwell School, Syracuse Mayor Ben Walsh discussed the positive outcomes of the work done by the Maxwell X Lab. He is flanked by Len Lopoo (left), Maxwell X Lab co-founder and director, and Joe Boskovski M.P.A.’14, the lab’s co-founder and managing director. With funding from the Allyn Family Foundation and in-kind support from Maxwell’s Center for Policy Research, X Lab and the city teamed up to develop an effective outreach strategy to communicate to owners who had fallen behind how potentially serious their situation was and to convey how easy it was to resolve it. Working with First Deputy Commissioner of Finance Martha Maywalt, the X Lab team developed an array of message options designed to spur owners to take steps toward getting current on their tax bills. “It should be clear in a few seconds what someone’s asking you to do; otherwise, you’re going to give up,” says Joseph Boskovski M.P.A.’14, X Lab co-founder and managing director, of the redesigned notifications. The team then conducted randomized controlled trials to evaluate the different messages and communications techniques to determine whether—and which—messages did a better job of improving outcomes. In total, courtesy letters were sent to 3,844 owners who were either delinquent on tax bills before 2017-18 and/or late on their current tax bills. An additional 1,922 owners were in the control group and were not sent courtesy letters in order to allow the researchers to compare outcomes. These tests provided concrete evidence about which changes are most effective while helping the city recoup at least $1.47 million in overdue property taxes. These changes will continue to benefit the city as outreach continues not only to property owners who did not receive courtesy letters this year but also to people who fall behind in future years. What’s more, a previous project for the city that focused on owners who had already entered the foreclosure process prompted nearly $100,000 in payments and helped to keep those families in their homes.